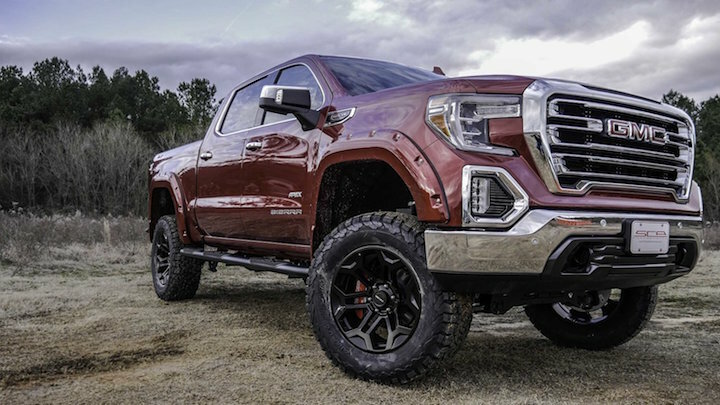 SCA Performance is a fairly well known provider of lifted and upgraded trucks and its just debuted its tuned take on the 2019 GMC Sierra 1500. 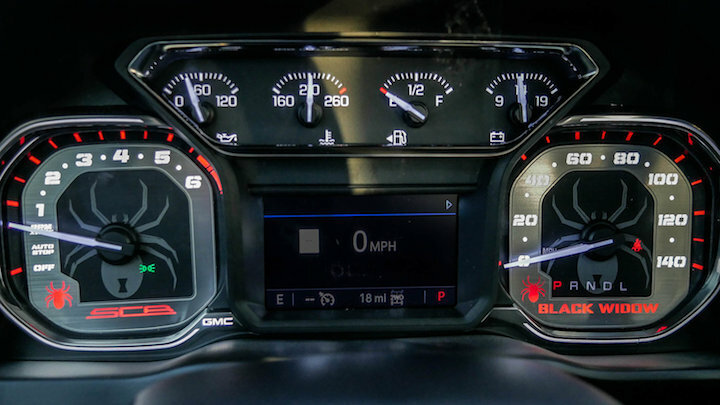 While the 2019 GMC Sierra has not been out very long, SCA has already managed to put together two different tuning packages for the truck called Black Widow and Apex. The SCA Sierra 1500 Black Widow gets the company’s 6-inch suspension lift kit, 20-inch ‘Black Widow’ alloy wheels, SCA fender flares, an SCA hood vent, SCA red brake caliper covers, black five inch side steps, a performance exhaust and 35-inch BFGoodrich at KO2 tires. The interior also gets some additional equipment such as red LED ambient lighting, Black Widow-branded gauges, Black Widow-branded stitched headrests, painted trim and tinted windows. The SCA GMC Sierra Apex isn’t as generously equipped but features similar equipment. The biggest changes are the 6-inch lift, 20-inch wheels with 35-inch BFGoodrich K02 tires, a stainless steel exhaust tip, SCA fender flares and 5-inch side steps. Both of these trucks are also offered with a number of optional extras from SCA, which include a high-clearance front bumper with integrated LED lights, black fender flare bolts, a 4-inch suspension lift system, leather seat covers and a number of different paint schemes. SCA, which is based in Trussville, Alabama, says interested parties can submit their order to their “nearest SCA stocking dealer,” to order their Black Widow or Apex 2019 GMC Sierra 1500. Click here for additional information on the SCA Black Widow and here for more info on the SCA Apex. SCA also offers upgrade packages for a number of other GM products including the Chevrolet Silverado, Chevrolet Tahoe and Chevrolet Colorado. It also offers upgrades for trucks and SUVs from crosstown Detroit rivals Ford and FCA, such as the Ford F-Series, Ram 1500 and Jeep Wrangler JK. SCA made 2 models based on regular cab short box 2wd Silverados. They were lowered and super looking. Guess that’s over? Sad . This truck needs to either ditch the flares or run a deeper offset wheel! SCA Performance Drops…? Don’t you mean lifted? Show us a slammed version.